The groundbreaking Interceptor Speed Camera System is the first ever system to combine the accuracy of precise speed camera detection with the effectiveness of on-site enforcement. It includes the first of its kind 2D multi-beam infrared speed camera with a tripod-mounted Wi-Fi repeater and in-vehicle router. 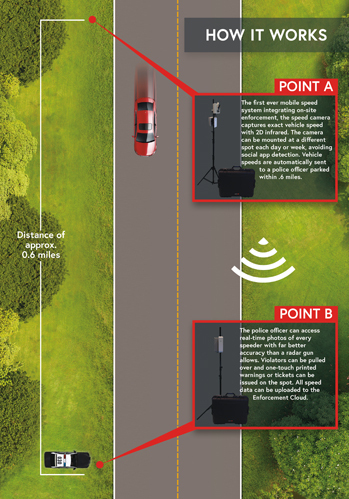 If the police officers are positioned within .6 miles, they can directly connect to the camera, can view real-time imagery, and offers printed warning or violations in the same time. Even by social apps, the Interceptor system is undetectable and allows municipalities with legal constraints on remote ticketing to penalize violators. In today’s life drivers speed driving put themselves and other people on the road at risk. So protect your roads by using these Enforcer Camera to maintain speed limit with state-of-the-art speed cameras.